Seeing as my last post was September’s Recipe Swap, my blogging frequency is clearly suffering. 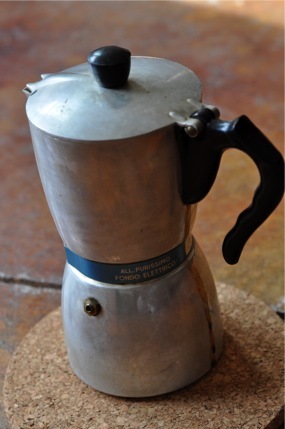 I’ve been busy blah blah blah…I’ve still been cooking blah blah blah…I’m done making excuses. More on that later. 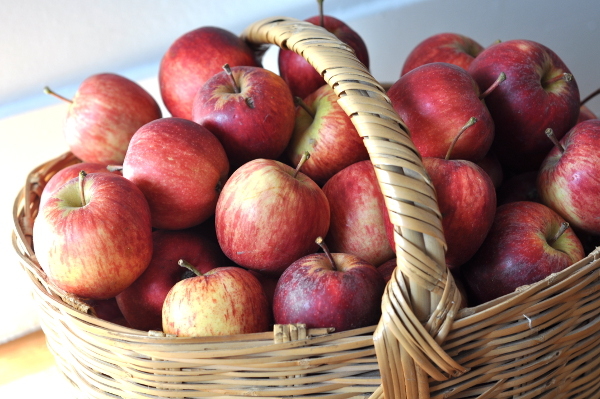 Apples: One of the many ingredients in Russian Salad. Christianna dished out a doozy of a recipe for everyone, as usual. 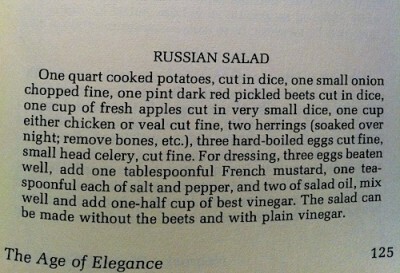 On my first read, I didn’t catch the veal or herring part of the Russian Salad. Potatoes, apples, beets, eggs, good vinegar – everything sounded good to me! I’ve never made a raw egg dressing before but considered giving it a try. According to Wikipedia, the dressing recipe for the original Russian Salad was closely guarded by its creator, chef Lucien Olivier, back in 1860’s Moscow. Lee, Doc (the dog), and I have been on vacation for the past week. We drove the 15 or so hours (I’m a Californian, I measure distance in hours, not miles) to Jackson Hole, Wyoming over the course of a day and a half. Then we spent one glorious week alternately relaxing, and, as Lee says, “power hiking” the trails of Teton National Park. To say it was beautiful would be an understatement. Between the fall-colored Aspens and Cottonwoods and the spectacular peaks I was barely paying enough attention to see all the wildlife. 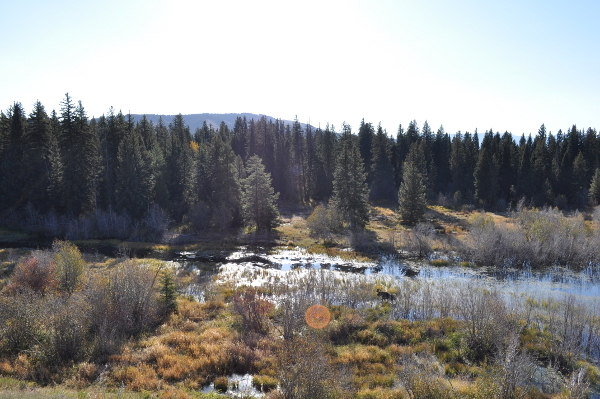 There were bears, moose, elk, deer, and bison. Until last week, I’d never seen a moose or a bear in the wild! Now I can say that my 15 pound dog has chased a bear (Don’t worry, the bear was oblivious and Doc just wanted to play!). The only downside to all this wildlife was watching people do stupid things to get a closer look. People disappoint me. Do you see the moose? I missed good food on our trip. We had some nice meals in Jackson and I got to cook with my mom in the condo, so that was nice. Driving through northern Nevada and Idaho, though, was rather trying for a non meat-eater. There were lots of potatoes, mostly in french-fried or mashed with butter in a 1-1 ratio. We ate breakfast at a roadside restaurant whose special was the “Giant Chicken Fried Steak Breakfast”. It was large enough to startle the (relative) locals next to us even when split between two plates. As you might guess, I was in serious need of some vegetables by the time we got home on Saturday. Thankfully there was a bag of Red Norland Potatoes left in the fridge from our last CSA box. 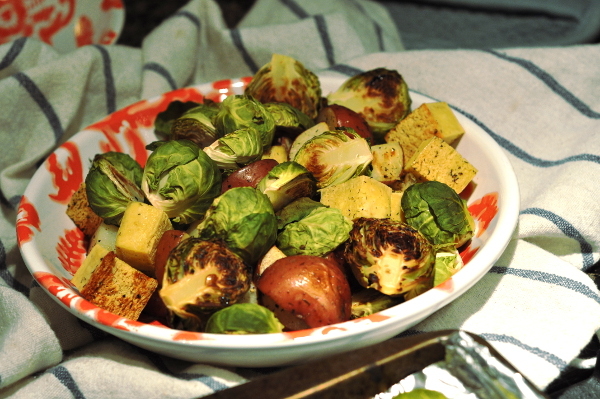 A thawed block of tofu and bag of Brussels sprouts later, I had exactly what I needed: a plate full of good food. That’s how I imagine the original Russian Salad: a heap of good food that works well together, especially in this transition to comforting Fall dishes full of root vegetables and apples. I may just start calling all my potato-based, weirdly delicious, concoctions Russian Salads. 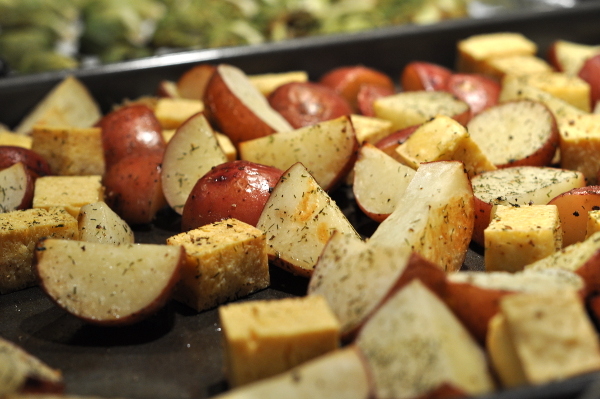 Roast the potatoes and tofu with olive oil and seasonings for 20-25 minutes at 375 F, stirring half way through. 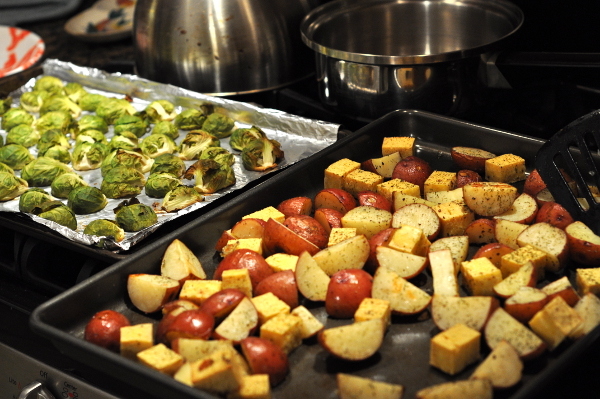 With 15 minutes left, add the Brussels sprouts to the oven, halved with cut side down on a separate baking sheet. Once everything is done, toss a little of everything on your plate. Don’t forget the hot sauce and ketchup, if you’re into that kind of thing. I apologize for this sad excuse for a recipe. I’m sure my fellow Recipe Swappers have much, much more polished interpretations of Russian Salad for you. What fruit cake?! 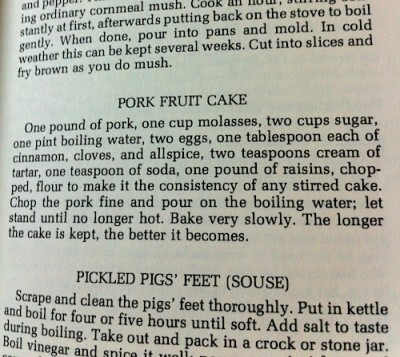 Pork…in a fruit cake. Okay, people, here’s the thing. I don’t do pork. Sure, I loved a crisp slice of bacon or a juicy BBQ tenderloin back in the day but the thought of “one pound of pork” in a cake – baked slowly and then kept around for a while to make it even tastier – that’s nasty. 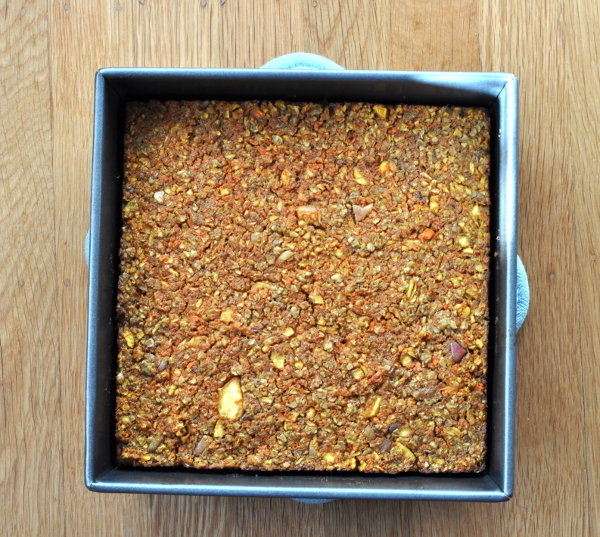 Christianna sure dished out a doosey for this month’s Recipe Swap. 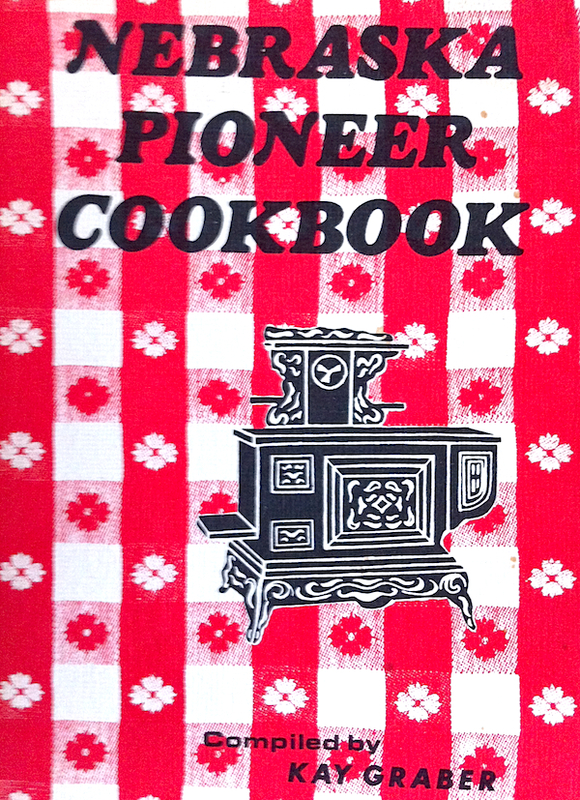 She even dug up a new (to us) vintage cookbook, the Nebraska Pioneer Cookbook. You gotta love the wood stove and the plaid table-cloth on the cover. I have to admit, as a pioneer braving the wild Nebraskan plains, a pork fruit cake would probably be the most delicious thing I could ever dream of eating. Think of it as the wild west version of the energy bar: you’d get your protein, carbohydrates, and fat all in one stick-to-your-ribs hunk of food! Just slather on some butter and you’d be ready to ride all day! Hand a Nebraskan cowboy a Powerbar and he’d probably spit it right back at you. Now, hand that same cowboy one of these muffins and I doubt you’d get so much as a questioning glance. Just don’t say anything about the tofu. Yuck! Pork Fruit Cake! -> What odd ingredient would a vegetarian put in fruit cake -> Tofu! 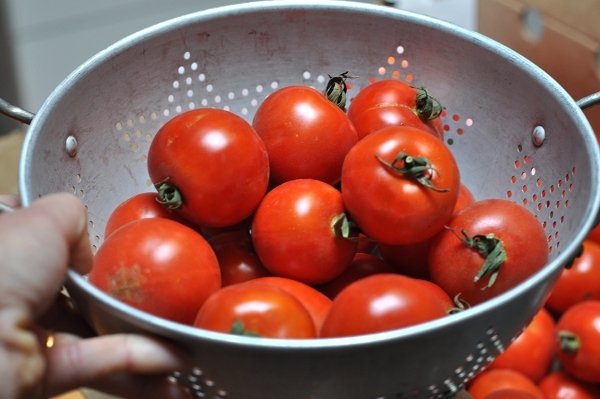 -> I’ve got all these tomatoes and I really want to bake with them -> There’s that classic spice cake recipe with a can of tomato soup -> I’ll use tomatoes and tofu! Slow-roasted tomatoes were the perfect sweet, smokey (dare I say meaty) addition to a block of silken tofu. Blended smooth, the tofu-tomato mixture was delicious on its own (thinned-out it would make an awesome tomato soup) and an adequately odd ingredient for muffins. Here’s where I screwed up: I decided to throw in the last tablespoon of blackstrap molasses at the bottom of the jar. Have you ever taken a recipe experiment just one ingredient too far and blacked-out other flavors in the process? Well, I lost all trace of the tomato-tofu puree when I added that little bit of molasses. I’m sure it still added moisture and protein of course but the muffins I ended up with were very good…molasses muffins! Argh! Some day soon I’ll make these muffins again without the molasses. Until then. I’m going to enjoy my apple-studded pork-free snacks. The spices remind me that Fall is almost here and these are sweet enough to keep me away from the ice cream carton after dinner. If you're in the mood for a traditional Mystery Cake (aka. 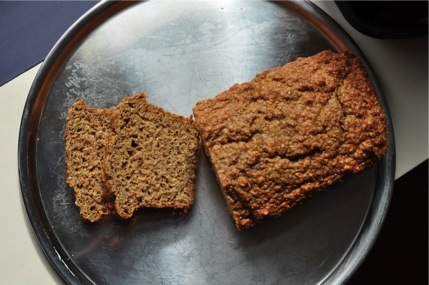 Tomato Soup Cake) this recipe from King Arthur Flour is the one on which I based my muffins. 1/3 to 1/2 cup slow roasted tomatoes. I used this recipe minus the spices. 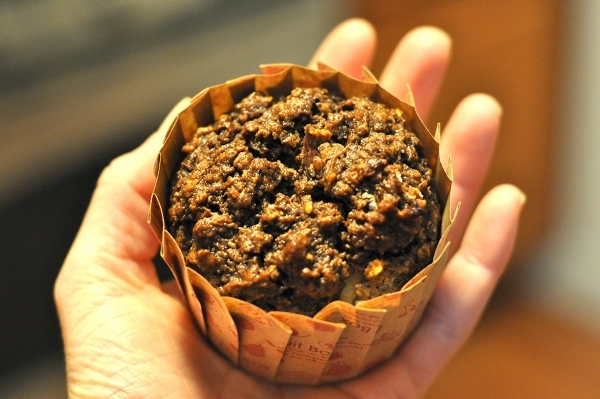 Prepare a muffin tin with some kind of liner or oil. In a food processor or in a large bowl, using a hand blender, thoroughly blend tofu and tomatoes. The mixture should be smooth with no lumps. If using a food processor, transfer the mixture to a large bowl at this point. Add remaining wet ingredients plus sugar to tofu, mixing completely. Stir dry ingredients into wet and fold in apples, avoiding over-stirring. Spoon batter into muffin cups. These don't rise excessively high so you can fill the cups to the top. 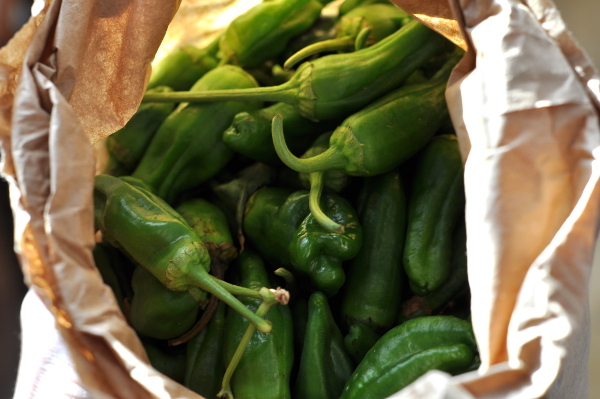 Cool on a wire rack and store in the fridge for longer shelf-life. I used leftover coffee to get the last bit of molasses out of the jar on a whim. It worked great but feel free to substitute water, juice, or milk. If you don't have roasted tomatoes leave them out. It'll work without them. 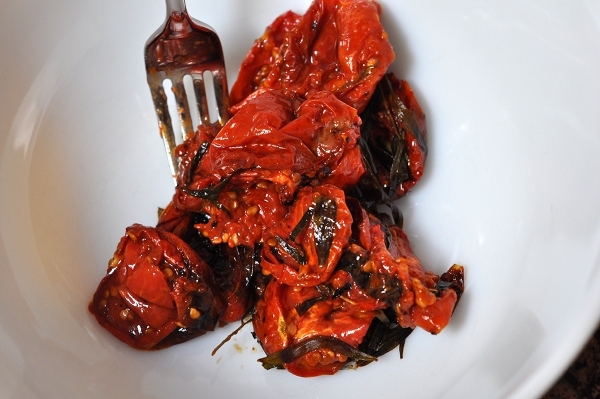 You could also get crazy and add some sun dried tomatoes (packed in oil or re-hydrated).